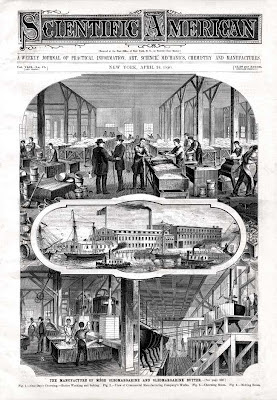 When five members of a congressional subcommittee came to New York in April 1880 to inspect the new factory of the Commercial Manufacturing Company, the firm rolled out the red carpet, hosting a dinner at Delmonico’s in their honor. 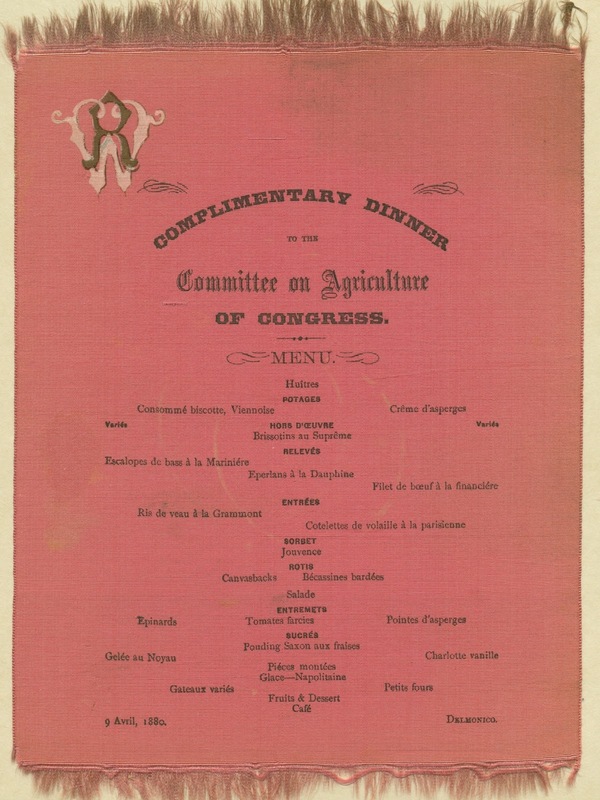 Typical for a grand banquet of the Gilded Age, the menus for the occasion were printed on satin of various colors. What is unusual about the menu shown below is what it doesn’t say—golden blocks of margarine were placed on the table to accompany the meal. What is more, the low-cost butter substitute was even said to have been used to prepare these classic French dishes. 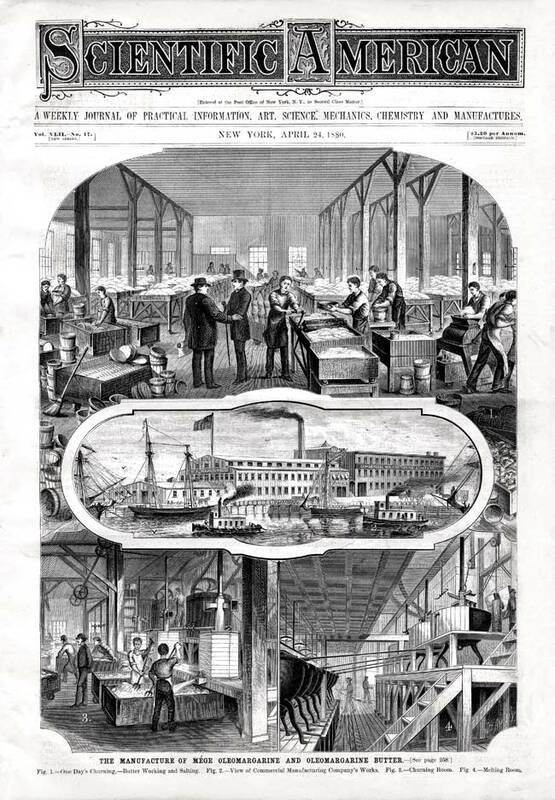 This was a heady time for the Commercial Manufacturing Company which was featured on the cover of Scientific American magazine that same month. 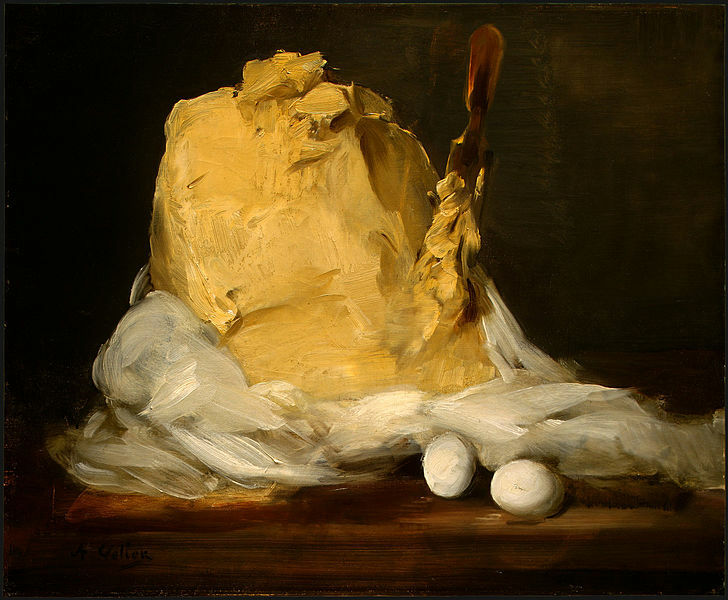 In addition, newspapers reported that both margarine and butter were served at this dinner; neither was labeled so the guests could make an unbiased judgment as to which one they preferred. Still, it seems doubtful that the banqueters consumed a quarter of a pound of margarine per person on average, as claimed by the New York Sun. Such exaggerations were not unusual in food reporting. Indeed, much of what passes as food history today is commercial hype that has slowly acquired a patina of credibility over time. Evidence to the contrary seldom surfaces. 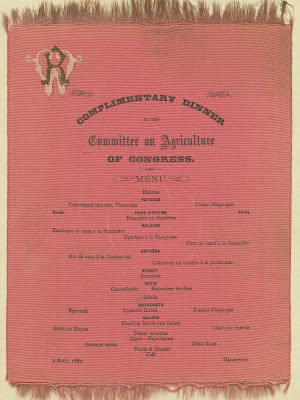 As for this banquet, the menu does not indicate whether Delmonico’s venerable chef, Charles Ranhofer, really substituted margarine for butter in his recipes that day. 1. In 1949, Congress repealed the tax on colored margarine; President Truman signed the Margarine Act into law the following year. Minnesota and Wisconsin were the last states to repeal their anti-margarine laws, finally taking action in 1963 and 1967, respectfully.